Join us at our YWCA Carnation Golf Scramble! Enjoy a day of golf at the beautiful Tannenhauf Golf Course located in Alliance, Ohio. Help us kick-off the Alliance Area Carnation Festival. The Festival is one of the highlights of the summer and is traditionally held during the first two weeks of August. The first Friday is reserved for the YWCA Carnation Golf Scramble. The YWCA Carnation Golf Scramble is a major fund-raiser for the YWCA. In the past 20 plus years, profits from our fund raisers have helped to provide Meals on Wheels, clothing to hundreds of women from our women’s career clothing closet, thousands of nights of shelter for low-income women in transitional housing, and thousands of hours of tutoring for at-risk area students. We appreciate your support! The tournament is a four-person Florida Scramble with women, men and mixed team divisions. A mixed team must include at least two women. 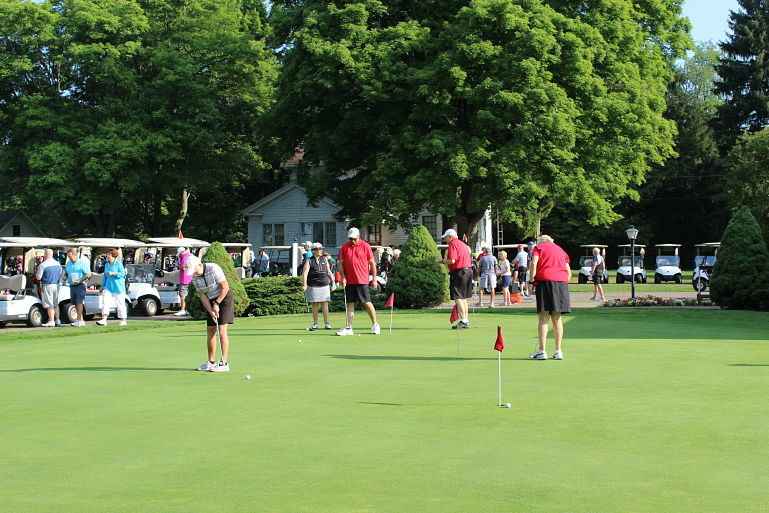 The entry fee includes the golf fees, ½ a cart, morning donuts and coffee, water, lunch, and lots of prizes. Mulligans will be available for sale. Pick up an entry form at Tannenhauf, the YWCA, or download a form below. Call if you would prefer we mail you one. Learn more about the annual Carnation Festival. Events are scheduled throughout the city. There is always something happening! Join us at our Apple Dumpling Booth during the Carnation Festival Days in the Park. One of the highlights of our small city’s summer is the annual Alliance Area Carnation Festival traditionally held during the first two weeks of August. Events are scheduled throughout the city. There is always something happening! The Festival concludes with a four day event held at Silver Park. The Days in the Park includes various Festival events, vendor tables, games, live music, and of course food. 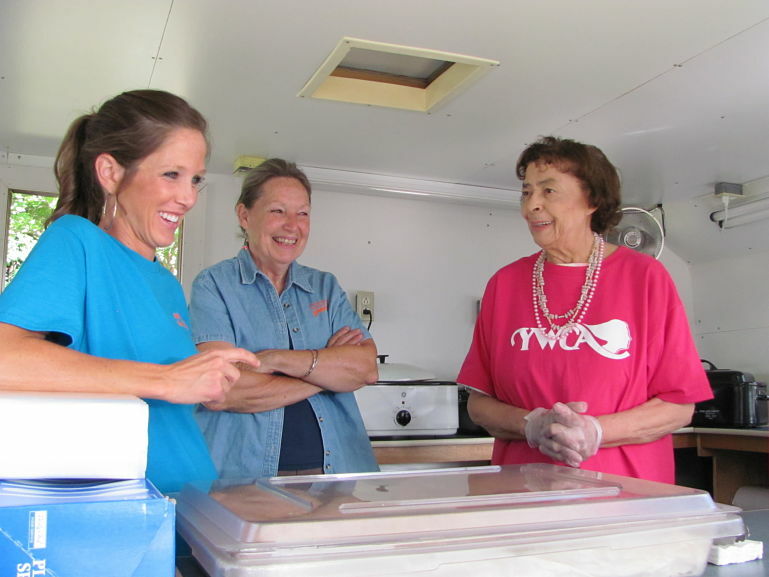 Non- profits and area clubs offer delicious foods served up by community volunteers. The best part is all the proceeds from our Apple Dumpling Booth are pumped right back into community services. It is a great way to support Alliance while listening to area bands perform, catching-up with friends, and enjoying special events such as the balloon lift-off, pet show, or fireworks. The YWCA operates a booth selling apple dumplings and cookies from Wednesday through Friday from 4:00 pm to 9:00 pm and Saturday from noon until the fireworks begin. We invite you to support the YWCA while savoring one (or more) of our delicious dumplings or cookies. Hurry in before we run out! You’ll be supporting services such as Meals on Wheels, Transitional Housing, The Closet, and youth programming. We appreciate your support! If you are interested in volunteering at our Apple Dumpling Booth, please call the YWCA at 330-823-1840. Shifts run for approximately two to two and one-half hours. It’s a great way to hear more about the work of the YWCA, get to know other members, and strengthen our community. Click here for more information about the annual Carnation Festival.